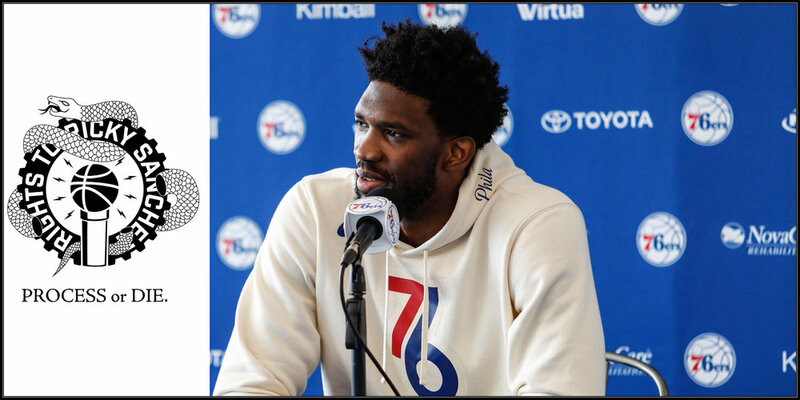 The 2017-18 Sixers exceeded the expectations of anyone who isn't a maniac or perhaps a parent of one of the players. We go back and talk about the things and players that surprised and disappointed us most. We hand out the annual Ricky Awards as well; everyone is eagerly anticipating who will win TJ McConnell of The Year. And we pivot to the offseason, as If Not, Pick Will Convey As Two Seconds writer and star Andrew Unterberger joins us to discuss his piece about this summer being the best ever. The Lottery Party is TUESDAY, Robert Covington WILL be attending, Pablo Torre WILL be marrying Lauren and Zeke, and the event IS sold out. We've got all of the information here, and we'll be releasing a podcast on Monday about the party. Maybe the greatest t-shirt we've ever sold, the Rights To Ricky Sanchez playoff series, "Process Or Die" shirt designed by one Tanner Lowry (the logo on our front page). It's available in black and grey (super soft Next Level triblend) right here and only available until Wednesday. The Lottery Party tees are still available here.